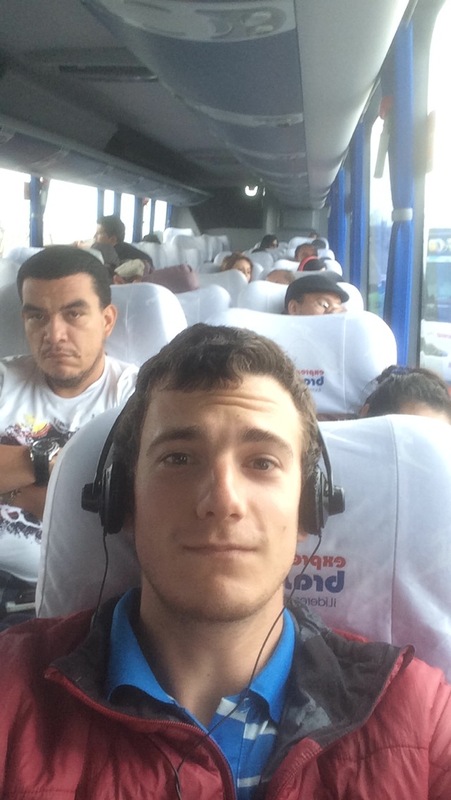 After an awesome day in Barichara, I bought a ticket for the bus to Cartagena. I had to prepare both mentally and physically for the 17 hour journey. I spent an hour or so resting up then headed out to the mall to get food to go. I ended up going to Subway because it was the most portable (kind of hard to eat a steak on a moving bus) Ordering a Subway sandwich in Spanish was easier than expected since most of the ingredients are listed on the glass case. Apparently “roast beef” is the same in Spanish. I ordered a footlong. One interesting thing is that there were no spices available to put on my sub. No peppers, no salt or pepper. This is a reflection of the incredibly bland Colombian food. I also got a real dinner before taking a taxi to the bus terminal. I stretched for about an hour until the bus arrived! After checking in my bag, I was given the first seat in the front. At 7:45 pm, we set off for Cartagena. As we were leaving, the bus driver turned on the movie Taken dubbed in Spanish. He also picked up a few locals and gave them a ride to the edge of town to make a few extra pesos. This ended up delaying the trip by about 30 minutes. Eventually we were off for real. On the bus to Cartagena! The roads in this part of Colombia are incredibly windy so i kept bumping into my seatmate, a middle aged man who did not appreciate the extra attention. The bus actually was quite comfortable. The nice seats reclined halfway to flat. There was wifi and a bathroom. They bus driver also cranked the air-conditioning up to the highest level so the bus was freezing. Luckily, I had read about this so I brought a blanket I took from the airplane (sorry!) and wore all my warm winter gear, so I was fine. I even got some sleep! At 2:30 am, we stopped for food. I woke up briefly and bought some water. Once we kept moving, I fell back asleep. When I woke up, the bus was on the coast heading west towards Cartagena. We still had a few hours to go, but it felt good to be in a new ecosystem. 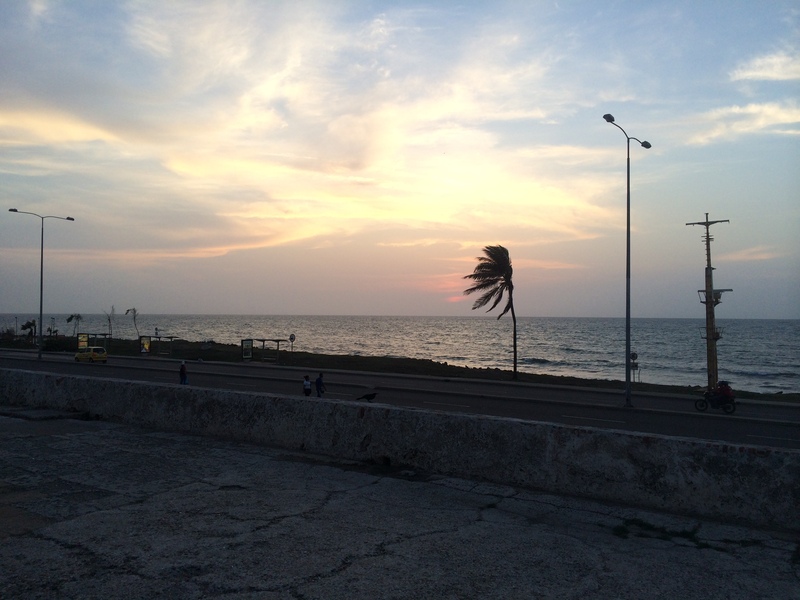 At 10 am or so, we stopped briefly in Barranquilla, a large city at the mouth of the Rio Magdalena. From there it took 3 hours to reach Cartagena. After leaving the surprisingly sketchy bus station, I took a cab to the city center. Actually the first cab tried to overcharge me by 5,000 pesos even though there were posted. I quickly found another driver who would take me for the posted rate. We drove through small roads in the city for about 45 minutes. The Caribbean coast appears to be much poorer than any of the other places I have been or at least they didn’t live as nicely. There seems to be a strange pattern all over the world of tropical/warmer places being poorer than temperate or cooler places. This seemed to be the case in Colombia. Certainly Bogota and the Andes had their share of poverty, but the people here appeared to have worse houses with corrugated steel roofs, were not dressed as nicely and were more aggressive in their mannerisms and certainly their driving. Bogota was certainly not peaceful but it seemed more orderly than here. The cab driver gave me some good scares on the drive over. Like most Colombian drivers, he naturally drives on the left, trying to pass people. If another vehicle is coming towards us, he brakes hard and switches quickly over to the right. We narrowly avoided about 30 accidents like this. I was somewhat more used to this due to all the bus rides, but being in the front seat was a different animal. Eventually we made it to the old city and to my hostel. 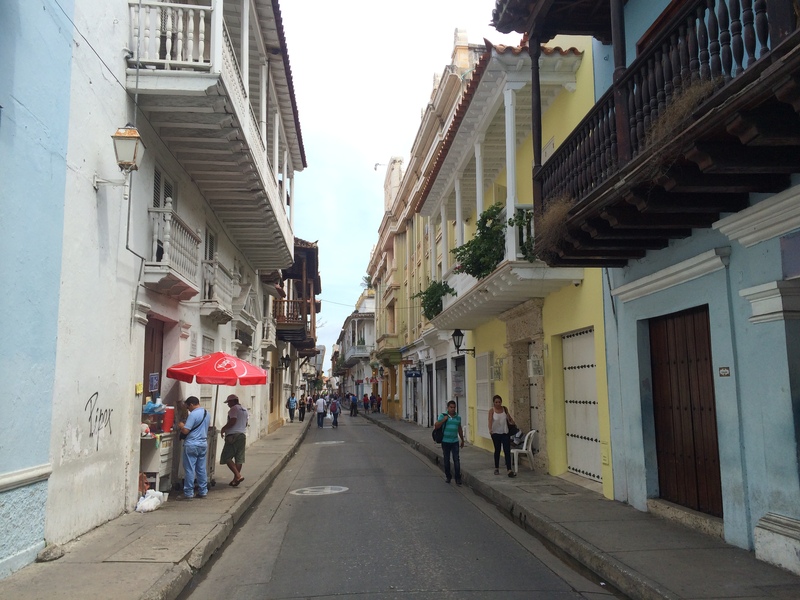 Cartagena had the same density as the French Quarter of New Orleans- 2-3 story buildings, narrow one-lane streets but with narrower sidewalks that could only support one person. Cars moved slowly through here as pedestrians wandered everywhere. The buildings were Spanish style and of many different colors. Just like New Orleans, the buildings here had very prominent balconies where people would look out onto the street, although nobody did. I got a quick lunch (very expensive by Colombian standards- 17,000 pesos or $6.50) and then wandered around the streets until I got lost so I could learn the geography. After an hour, i figured everything out and could easily navigate to anywhere in the old city (it’s not that big). I also checked out the impressive city walls. There were porticos in the walls where lots of local couples were making out. It probably would be a romantic spot (somewhat secluded, small enough to force you to get close, historic, and views of the ocean) were it not for the hundreds of tourists walking by every hour. I saw at least 15 couples making out in the 20 minute spent on the wall. For some reason most of the museums and churches were closed (other than the naval history museum). So I really didn’t do anything other than people watch and wander for most of the afternoon. Since I was pretty tired from the bus ride, I went back to the hostel to rest up. I had a chat with my bunkmate, Nate from New Zealand. Like most of the travelers here, he was on a 5-month trip through South America. He started his journey in Argentina and went through Brazil, Bolivia, Peru and Ecuador before finally reaching Colombia. Most of the travelers in South America went on that route with some skipping Ecuador because there isn’t much to see in northern Peru and it is cheaper to fly straight to Colombia. Very rarely, I would meet a traveler who went through Chile or came down from Central America. My hostel was huge- over 30 rooms. I soon realized that everywhere I went the first week was not on the main tourist route. Nobody in my hostel had been to San Gil or Villa de Leyva. More than that, the hostel’s wall map of Colombia didn’t even talk at all about that region. They all went up from Ecuador through Cali then the Coffee Region then Medellin and were going up to Santa Marta. 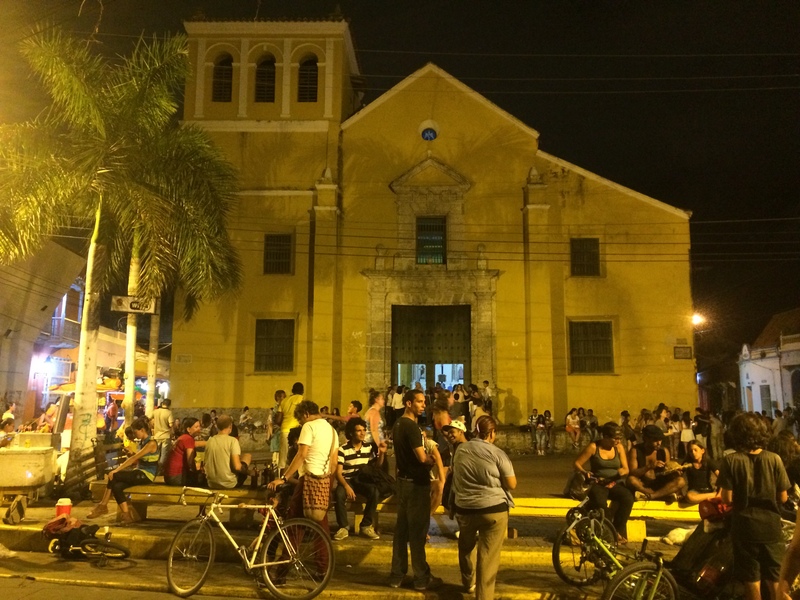 Unlike in the Colombian highlands, the backpackers in Cartagena were young (around my age rather than in their 30’s and up. As I was settling down, I got a message from Jason and Jenny, the British couple from Day 2 in Bogota. They told me they were in Cartagena and wanted to meet up. So I went to the city wall to watch the sunset. Unfortunately, the sun hid behind a storm and the sunset was a huge disappointment. We then walked over to get dinner. We went to a less touristy part of town where a lot of locals were hanging out in a square. We went to a pizza place. There, 4 kids came up to our table and started rapping for money. I have no idea if they’re good or not, but it sounded okay. Rapping in Spanish must be a lot easier since basically every word ends in one of 3 or 4 different sounds. After dinner, I walked back to the hostel and tried to go to bed, but some British girls in my dorm wanted to drink. So I hung out with them while they drank before going out. Eventually they left and I was finally able to go to bed. I woke up around 8, which is later than expected probably because the hostel dorm had air conditioning and the room had good blinds. In other hostels the sun woke me up. After getting breakfast, I had to decide what to do. I talked to the tour desk and decided to go to the mud volcano. The tour left at 2pm so I had some time to kill. I decided to walk to the castle, which is across a gross river from the walled city. The castle towers over the city. 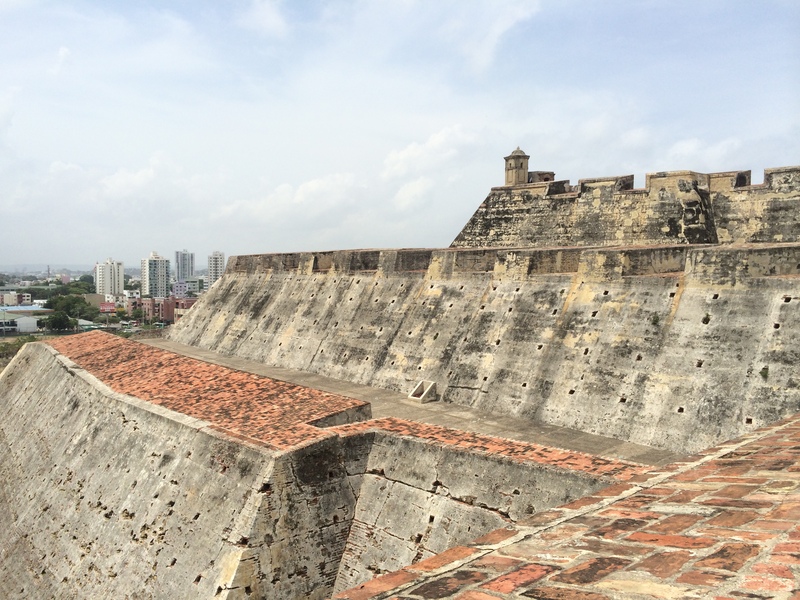 It apparently took 300 years to build as the requirements to defend the city changed. 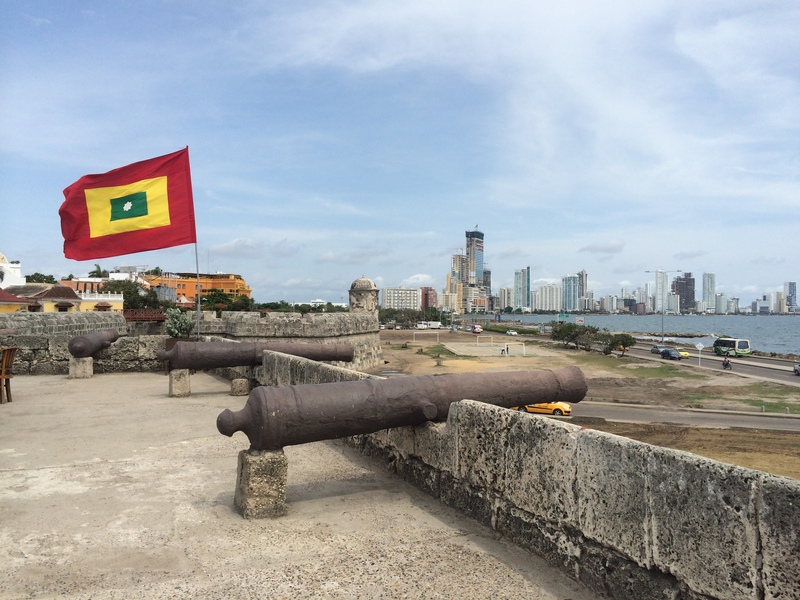 Cartagena, one of the oldest cities in South America, has always been important because it was the main Spanish port on the continent and the gateway to all the riches and gold. It was also the only port authorized to trade slaves in South America. All the treasures of the Inca and other cultures went through Cartagena. As a result, over the years many pirates and British floatillas tried to attack the city. While the city had been stormed multiple times, it was never destroyed. The castle itself was really interesting to explore, although the 95 degrees with 95% humidity made the experience much less fun. Luckily, the builders of the castle installed tunnels that got huge cool drafts of air. On the way back to the hostel, I got assaulted by hawkers trying to sell me cigarettes but actually cocaine. They ask me loudly if I want to buy cigarettes. I say no. Then in a low voice, they say something along the lines of “you wanna some Charlie?” Charlie is apparently British for cocaine. Of course i say no. 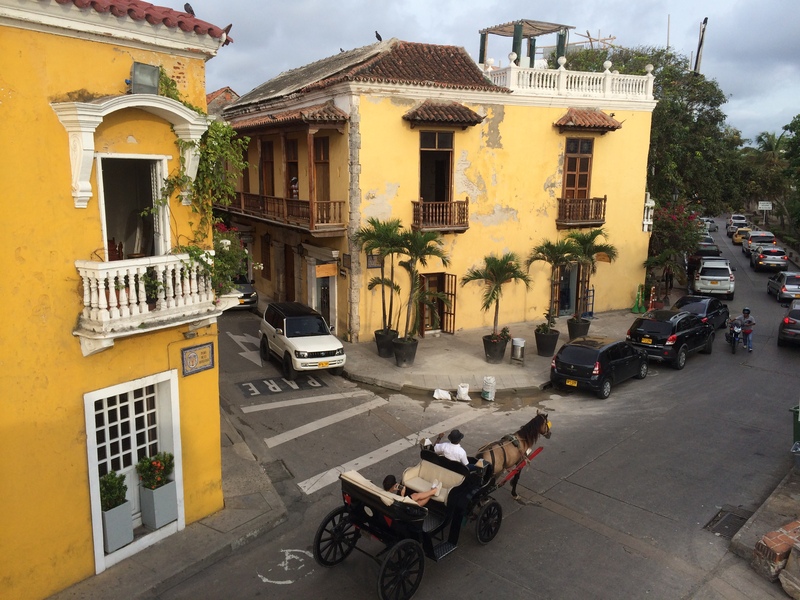 Throughout my first day in Cartagena, about 10 people have tried to sell me cocaine. My favorite was a guy who first tried to sell cigarettes then walked up to me and in this deep Caribbean/Sebastian the Crab accent said “I have everything”. That time I broke down in laughter while he walked away confused. I got a falafel for lunch, which was quite an unexpected find. I later learned that lots of Middle Eastern people emigrated to the Colombian coast- Shakira’s father is one of them. So they brought their food with them. The falafel was kind of a fusion as it came in a tortilla and had cheese. It was quite delicious. 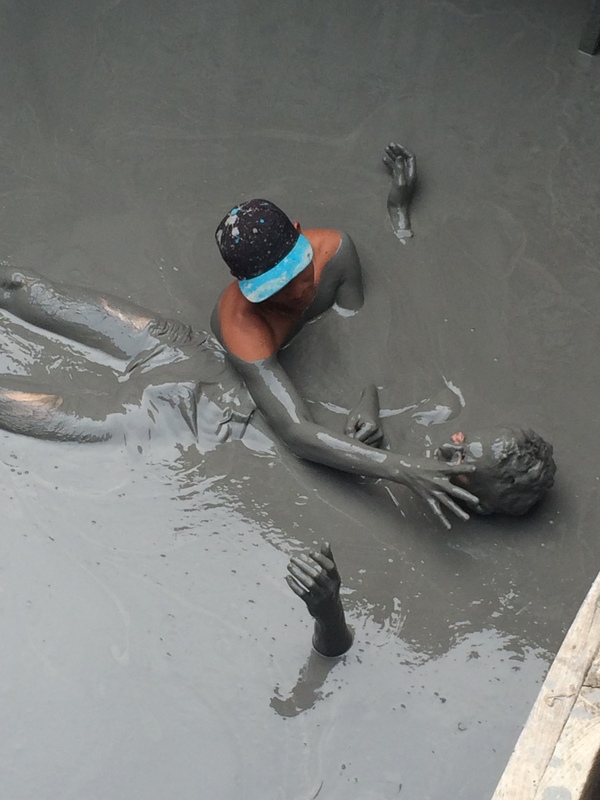 I returned back to the hostel and changed just in time for my afternoon tour of the mud volcano. I really had no expectations for the tour and it definitely was the strangest experience of the trip so far. The bus had room for 25 but for some reason there were only 4 people on the tour- 3 Finnish people and me. 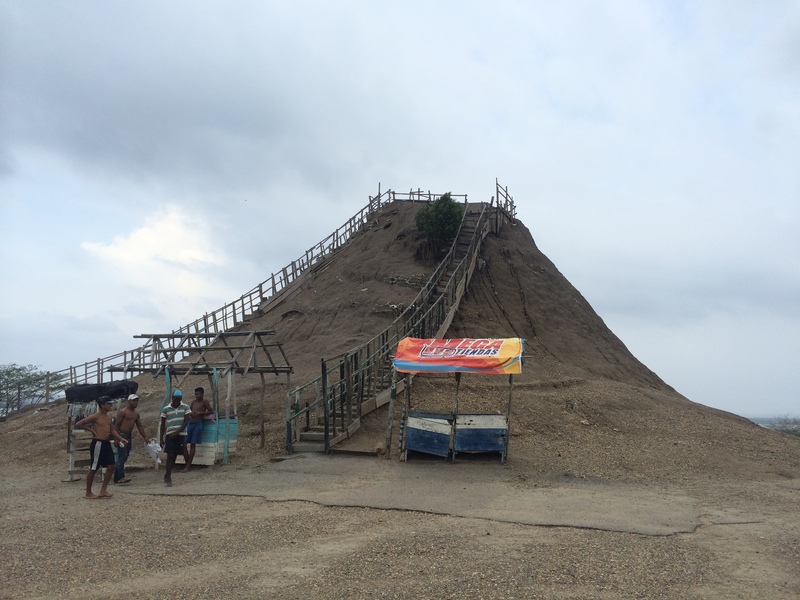 We bussed for about an hour before arriving at the mud volcano, which was basically a 50 ft tall mound of dirt. While it was most certainly volcanic shaped, it was quite underwhelming. I asked the guide about the history of the volcano, but she could not give me an answer. After changing, we walked up the questionable staircase to the rim of the crater where I found a pit of mud about 12 feet deep into the mountain. All the locals were hanging out there. They told me to jump in so I did. Splat! As I was jumping in, a man no older than me started to walk into the mud. He grabbed my head and tried to massage me. I jumped, but there was nowhere to go as the pit was about 8 feet long and wide. I got a forced 5 minute massage and was then told I had to pay $3,000 pesos or about $1.25 USD. While the massage was fine- I felt extremely uncomfortable during the entire process as it was forced on me and that it was this random guy. Immediately after the massage, the Finns jumped in and they too were forced to get massages. All part of the experience. The mud was actually quite nice. It was somewhat warm and was quite dense. Kind of like the Dead Sea in Israel/Jordan, you can float. This was probably a little bit denser than the Dead Sea. After about an hour in the mud, we walked down the volcano to the nearby lake to wash off. There, women from the village started pouring buckets of water on us and started scrubbing us down ala the Wizard of Oz. After they determined we were clean, they told us it would cost is another 3000 pesos before walking away. The lake was very warm, beautiful, and peaceful. Well it was peaceful until we stated getting bitten by fish. They were definitely not piranhas- it tickled more than it hurt. Immediately we ran out of the lake. 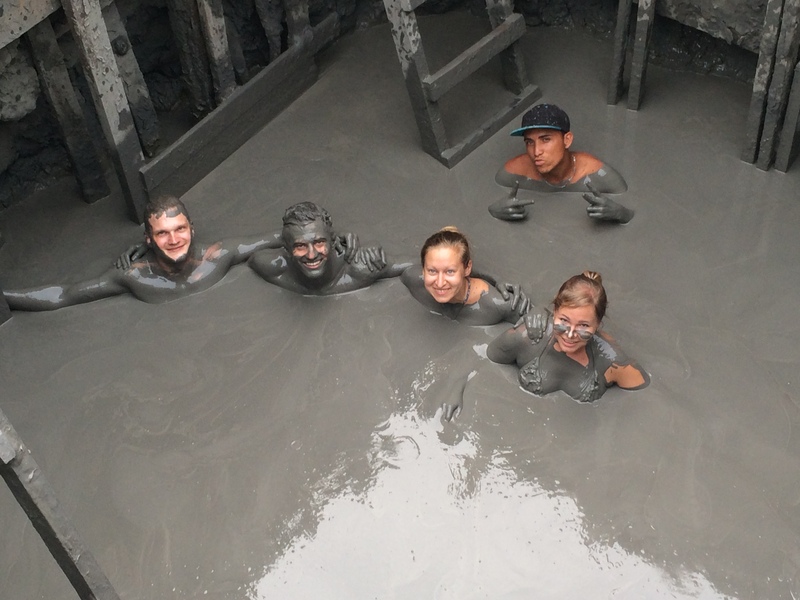 We returned to the bus, paid everyone and quickly left the mud volcano. The entire experience, which cost a total of $20 USD was a mix between relaxing and uncomfortable. That said, I’m glad I did it- traveling is all about these unusual experiences. After returning to the hostel, I hung out with my bunkmate, Nick from New Zealand. He was telling me about going out in Colombia. He was a fan if using Tinder. He told me to download it as he meets up with “chicks” an average of 6 days a week. This is normally not my thing but I decided why the hell not and set up a date with a local girl the next evening. Something different, I guess. That night Nick and I got dinner. We went to a local place and paid reasonable prices (for once) although the food was terrible. The restaurant had 5 pictures of Jesus on the wall, which means it’s a local place. That night there was a big hostel party, but I decided to go to bed early and rest up for a big day tomorrow. Woke up at 7 and headed over to the dive shop to start my scuba diving day. 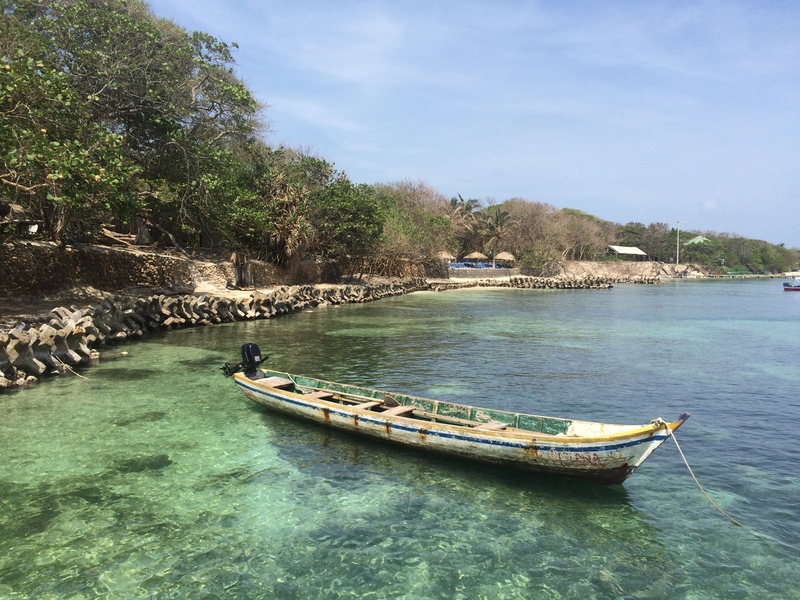 At 8, we headed over to the dock and got in a public boat to Isla Grande in Islas Rosario National Park. We then got into a scuba boat. Besides me and my scuba instructor, there were two sisters from DC/New York celebrating a birthday and a British ex-pat who met a Colombian woman, decided to stay in Cartagena, and now runs the top travel site for Cartagena. The first dive was the deepest I have ever done- 89 feet below the surface. At this dive site, the underwater shelf drops off and plunges down a wall of coral. My focus on this dive was my breathing- on previous dives, I used my air too quickly. This time, I did really well and was able to complete the 38 minute dive. The scenery was quite nice although nothing extraordinary. The highlight was seeing 5 lobsters hiding in a small crevasse. Their tentacles were incredibly long. Before going on the second dive, we took a short break back at the dive shop. There I was approached by a salesman names Wilmer who tried to sell me coral beads which he claimed were hand-made in his house down the road. As self-described artisan, he had a tough sales pitch starting with building rapport by commenting on my knockoff Colombian football jersey. Then he told me that “on the islands, everything is cheap”. Then, he showed me the worthless beads and asked me which was my favorite. I didn’t have one, but he made me pick one anyways. Then he told me the prices, which were actually quite expensive. I told him I had no money on me, so he gave me a small necklace as a present and said he would find me again. During this elaborate sales pitch, the dive boat almost left without me. Luckily, someone yelled my name and I ran over and got in the boat. 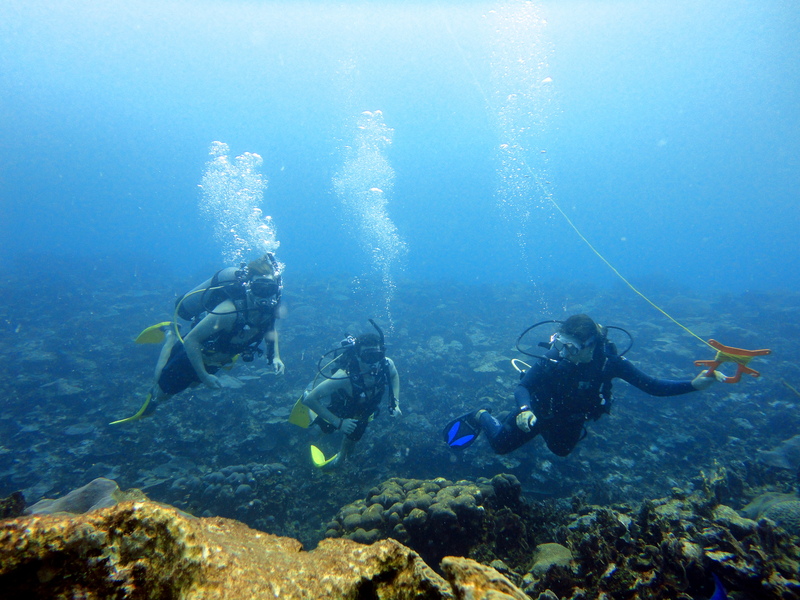 The second dive was shallower, we only went 50 feet down, but the scenery was much better. The coral was brighter and we saw schools of fish! It was very pretty. That dive also lasted 40 minutes. After the dive, we returned to the island for lunch, where I successfully ignored Wilmer. We then headed back to Cartagena, arriving around 4:30 pm. I rested up at the hostel until 7:30 when I went on my “date”. I was nervous because I’ve heard about kidnappings in Colombia but figured it would be fine since we were meeting in a public place. We met at the main plaza in the old city and pretty much walked around for 4 hours. This was the first time I had been able to have a meaningful conversation about Colombia because everyone else I met either was trying to sell me something or didn’t speak English. The girl was very proud of Colombia and of her city Cartagena. She kept asking me if I liked Colombia and seemed to be very happy when I said that I am having an awesome time here. She also said I was the tallest person she had even met. 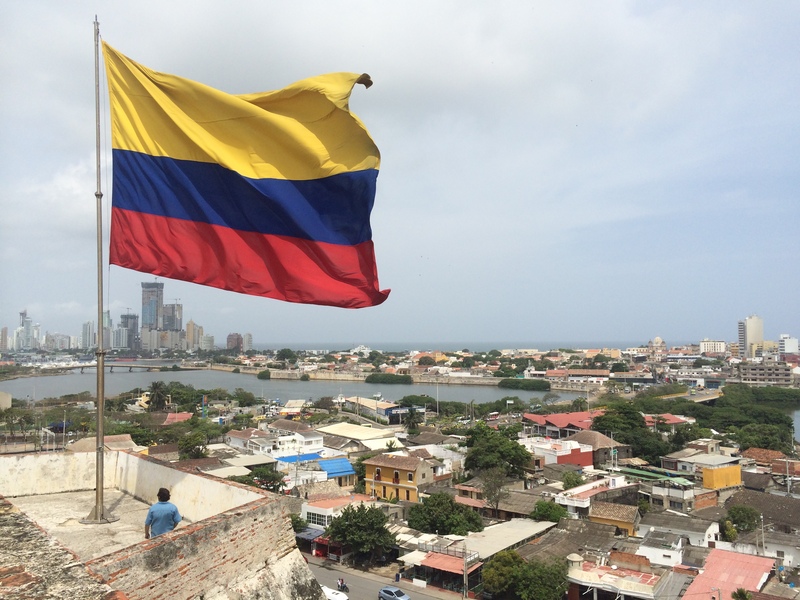 We talked a bit about Colombia’s image. Most people thing that Colombia is a dangerous drug-haven run by cartels. While there are parts of the country while this is still true, the vast majority of where people live is completely safe. It really has changed in the last 10 years. We ended the night sitting on the ancient city walls overlooking the ocean. Then she said, “even though your body will be in Medellin or Los Angeles, your heart will always be in Cartagena” before giving me a goodbye kiss.